This tour starts with a short orientation of Cape Town, the “Mother City”, before we check into our overnight accommodation, close to the Victoria and Alfred Waterfront. Cape Town is a diverse city with a range of different attractions, sites of interest and activities. Over the next couple of days we will enjoy the scenery of the Cape Peninsula, the beautiful beaches of Clifton and Camps Bay, the vibrant Victoria & Alfred Waterfront and Cape Town’s city centre. A cable car ride up Table Mountain (at guests own cost) can also be enjoyed – time and weather permitting. The evening is free to enjoy at leisure. Today we explore the ‘Fairest Cape’. Following an exquisite stretch of coastline known as Millionaire’s Paradise – from Camps Bay and Clifton to the exclusive beach hamlet of Llandudno – and on towards the charming working harbour of Hout Bay. An optional (at guests own cost) Seal Island cruise can be taken allowing for up-close-and-personal seal experiences. From Hout Bay, we wind along the world renowned Chapman’s Peak Drive, which boasts breathtaking ocean views and majestic cliffs, before arriving at the wild and beautiful Cape of Good Hope Nature Reserve rich in flora unique to this area. We meander back along the coast, visiting the historic naval port of Simon’s Town and the endearing penguin colony at Boulder’s Beach, before arriving back in the city in the late afternoon. Today is spent celebrating the exceptional winelands region with its spectacular scenery. Experience some of the area's rich history, as we drive through the region - stopping to enjoy a wine cellar tour and learn about the process of winemaking, from start to finish. We visit the little town of Franschhoek, with the impressive Huguenot Monument. Lunch (for guests own account) can be enjoyed at a variety of restaurants and cafes in a town with a reputation for gourmet fare. After lunch we head towards the charming university town of Stellenbosch, where we enjoy a stroll through this quaint little town with an assortment of interesting little shops. A trip to the winelands wouldn't be complete without a wine tasting and we will stop at one or two different wine estates, where wine can also be purchased to take back home. Today is spent enjoying the city of Cape Town at leisure. Your guide will be available to assist and advise and is available for transport. Depenidng on individual preferences, you may wish to take a drive to Hermanus to do some whale-watching in season, take a tour to Robben Island or explore the isolated beauty of the West Coast. All activities, except for the transport are for your own account (distances and times travelled should be reasonable and your guide will be happy to advise you). To cut down on the cost of this tour, you may want to give some thought of staying in Cape Town on your own without the services of a guide - all the hotels in this city can assist with daily and half-day tours to various regions in and around the city, identical to those offered above, with the exception that you will in all likelihood be with other guests on these excursions. This will work out less expensive than if you had a guide with you for the entire period. If you choose this option, we will arrange for accommodation in Cape Town for you (depending on your preferences) and you then book your daily excursions at the hotel - you also then have a better idea of what the following day's weather will be, what you want to do, and in what order (as well as many other options not offered in this tour itinerary above). This morning we fly from Cape Town to the Kruger Mpumalanga International Airport in Nelspruit or to Skukuza Airport, from where we travel the short distance into the Kruger National Park. Kruger National Park offers visitors a wildlife experience, ranking amongst the best in Africa. Established in 1898 to protect the wildlife of the South African Lowveld, this world renowned national park - nearly 2 million hectares in size offers an immense diversity of animals, birds and plants and is a world leader in environmental management techniques and policies. Kruger National Park - truly the flagship of the South African national parks is home to an impressive number of species including: 147 mammals, 507 birds, 114 reptiles, 336 trees, 49 fish and 34 amphibians. Kruger Park offers visitors regular sightings of lion, elephant, zebra, giraffe, warthog, wildebeest, monkey, baboon, impala and hippo, with the more elusive animals like leopard and wild dog being an exciting find. 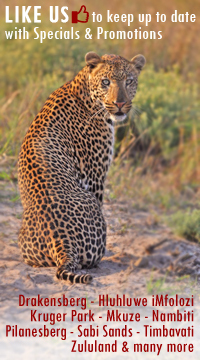 We enjoy a sunset drive in an open safari vehicle on one of the evenings, to enhance the chances of seeing the parks nocturnal species such as leopard, hyena, lion, bush babies and genet, as well as the smaller cats, owls and nightjars. These drives are conducted by SANParks, the organisation tasked with running this Park. Our overnight accommodation in Kruger is in bungalows inside the Park. Although not graded, these bungalows are of a two or three star standard. The rooms have twin beds, a private shower, toilet and hand basin en-suite. The rooms are built of brick with thatch roofs and are equipped with air-conditioning, some also with ceiling fans and a fridge. There is insect proof screening on the doors and windows. Bath and hand towels as well as soap, are provided. In the game reserve we will have breakfast and dinners in the restaurants. Guests will enjoy a full game-viewing programme during the stay in Kruger Park where your guide, in his own closed vehicle will conduct the remainder of the game drives. Early morning starts are encouraged, as this is considered the best time of day for viewing animals. After our morning game drive and breakfast we leave the Kruger National Park for the drive to Johannesburg – we reach the city in the late afternoon where we will drop you off at either your overnight accommodation or at the O R Tambo International Airport in time for your flight.